There are so many things to consider before choosing your wedding car, it may not be as simple as choosing your dream car sometimes. 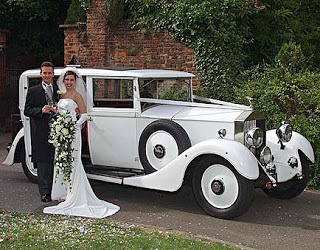 If you are having a themed wedding, then the car has to be part of that theme, so a latest sports car would not match a morning suit and a wedding dress of vintage style. Pretty much everything is available for rent these days when it comes to wedding. If you have money then you can have the best things in the world on your wedding day. The longer the period that the rented item is necessary, the higher the cost will be, automatically. Other essential factors to aim into your process of decision will be how many people are there to transport, how far they have to go and which season of the year. You can choose Bentley with open top if it is a summer wedding. The wedding comes with a wonderful artistic value and can contribute to the creativity and quality of the wedding pictures. So, if you can afford it, guests of your wedding party could also be transported in some matching vehicles, it adds an additional feel of style. Remember that vintage cars are very old. They are not appropriate for long journeys, and they can’t go fast. If you have a long way to go, it would be good to make sure that the car is in good working condition, you can have it mechanically checked first. Checking all the arrangements more than twice is very important when it comes to wedding. Just don’t depend on a photo of the vehicle, make sure to check it out personally, because pictures can deceive you sometimes. Make sure that the vehicle is big enough to accommodate all those who need to be carried from one place to another or you can also arrange for another vehicle. Ensure that the hiring company is aware of the place where you are holding your wedding party, make sure that each and every item on the itinerary has been mentioned. Couple will be traveling together once they are married. This is the right time when they can be certain that all of their efforts and hard work have been paid off, and they can enjoy the best treatment and celebrate their joy in their choice of luxury car.